Ilfracombe subcontract machinists, Richmond CNC, has installed its first 30-taper vertical machining centre (VMC) to cope with a steep increase in medical and aerospace work. 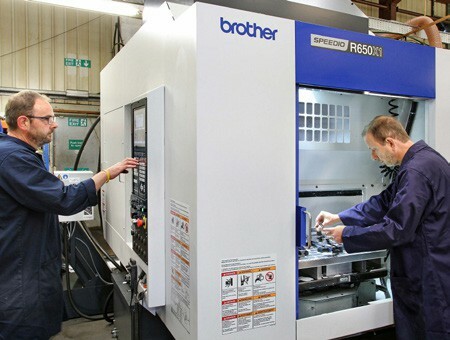 It is a twin-pallet Speedio R650X1, built by Brother in Japan, and has transformed the speed and efficiency with which parts are manufactured, according to the subcontractor’s managing director, Gary Rich. Supplied in May 2016 through sole UK agent Whitehouse Machine Tools (www.wmtcnc.com), the machine joined three other VMCs and two horizontal machining centres (HMCs) on the shop floor, all 40-taper machines. Mr Rich said, “As its name implies, the Speedio is billed as a fast machine. 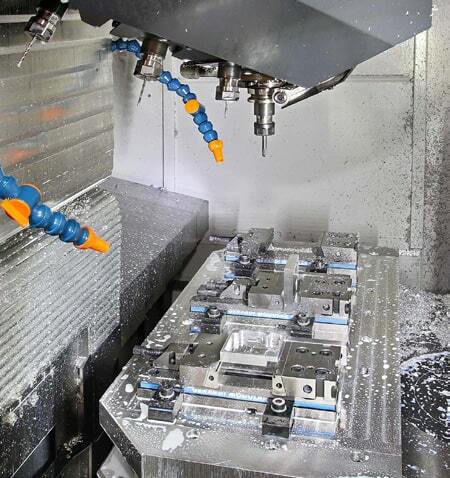 It executes 50 m/min rapid movements at the same time as automatic tool change and pallet change, so it is ready to cut the next component immediately it arrives in the machining area. “I was expecting it to be faster than our existing plant, probably by around 20 per cent, but we were flabbergasted by its speed when we put on the first job. The aspect that most surprised Mr Rich was that, with a little tweaking, the same program was used in the Brother control, including identical spindle speeds and feed rates. The large cycle time saving was therefore entirely down to a reduction in idle times due to all machine movements being so much faster. Another early job put onto the R650X1 was a stainless steel hydraulic manifold that is produced in 41 seconds, rather than 90 seconds on the HMC, representing a 54 per cent saving. However, the main reason for purchasing the 30-taper machine was a big increase in the number of aluminium components Richmond CNC was machining for a customer in the medical sector. Brother machine, which has reduced cycle times by an average of one-third. It is a similar story during manufacture of a range of components used in hydraulic oil and cabin air filtration systems for the aerospace industry, which accounts for around half 2 of thesubcontractor’s turnover. Mr Rich confirmed, “These components are also produced between 30 and 40 percent faster on the Brother, despite more, shallower cuts being taken than on the HMC. It is all down to agility of the cutter around the machining area. “The 30-taper machine is not only fast but accurate as well. For example, we regularly produce rails for a medical microscope to within ± 10 µm on some dimensions and 0.1 Ra surface finish. Richmond CNC is a family-run, 15-employee business, established in 1977 by Jim Rich. It is now run by his son Gary, who has been with the company for 35 years, and his wife Cindy. Their son Kai operates VMCs on the shop floor and daughter Cassandra works in the office. Purchase of capital plant is meticulously researched. Mr Rich first considered whether a 30-taper machine would have enough power and rigidity to produce components efficiently , bearing in mind that much of the subcontractor’s work involves steels, stainless steels and nickel alloys. Having satisfied himself that modern machine tools in this category are strong enough, he considered models from four potential suppliers. The Brother machine was selected, as it was deemed to be the most productive and best value for money. It was ordered with a 16,000 rpm spindle, 22-tool magazine, swarf conveyor and air filtration unit. Unlike with other VMCs reviewed, the Brother twin pallet change system was supplied as standard. It is the manufacturer’s proven Quick Table, which effectively provides two pallets in one by rotating about its centre. There is no pallet lift, speeding 180-degree swivelling to 3.4 seconds and sealing the structure against swarf and coolant. Other notable features of the R650X1 include linear axis travels of 650 x 400 x 305 mm with up to 30 m/ min cutting feed in each, 200 kg maximum load per pallet, 150-milliseconds spindle start-up and stop, and 0.9 second tool-to-tool ATC. If Mr Rich decides in the future to retrofit thaxis indexing units on the pallets, they will also position themselves along with the linear axes during simultaneous ATC and pallet change. Control is by Brother’s own CNC-C00 with 12” colour screen. As a postscript, Mr Rich mentioned his company’s one OEM product, a superhigh-quality chess set comprising machined and polished stainless steel and bronze pieces and a board made out of the same materials (think Harrods and Mappin & Webb). All pieces visit a CNC lathe as well as a machining centre and the Brother VMC will be ideal for efficiently carrying out the large amount of metal removal required on the complex pieces.